Although Columbus was primarily a dead reckoning navigator, he did experiment with celestial navigation techniques from time to time. However, these experiments were usually unsuccessful -- and in some cases, actually fraudulent. In celestial navigation, the navigator observes celestial bodies (Sun, Moon and stars) to measure his latitude. (In Columbus's day, it was usually impossible to measure your longitude.) Even in ancient times, it was fairly easy to find your latitude by looking at the Sun and stars, as long as you weren't too concerned about accuracy. Each star has a celestial latitude, or declination. If you know the declination of a star that is directly overhead, that's the same as your latitude on earth. Even if a star isn't directly overhead, if you can measure the angle between the star and the overhead point (called the zenith), you can still determine your latitude that way -- provided you measure the star at the time of night that it is highest in the sky. But in the Mediterranean Sea, it's not very useful to find your latitude, because your latitude is roughly the same wherever you are. In those confined waters, dead reckoning was the easiest way to navigate. It was not until the fifteenth century, when Portuguese mariners began to make long voyages north and south along the coast of Africa, that celestial determination of latitude began to be useful for southern European sailors. Columbus was from Genoa, one of the leading Mediterranean ports, and he must have learned his dead reckoning navigation from Genoese pilots. But he had spent time in Portugal, and was aware of all the new ideas in navigation, including celestial navigation. So on his first voyage he made at least five separate attempts to measure his latitude using celestial methods. Not one of these attempts was successful, in part because of bad luck, and in part because of Columbus's own ignorance of celestial techniques and tools. The most important tool used by Columbus in his celestial attempts was the quadrant. This was a metal plate in the shape of a quarter-circle. From the center of the circle hung a weight on a string, that crossed the opposite edge of the circle (see figure 1). The navigator would sight the North Star along one edge, and the point that the string crossed the edge would show the star's altitude, or angle above the horizon. (In the case of the North Star, this is always pretty close to your latitude). Many examples of quadrants survive in maritime museums, and often have several scales along the edge. For example, in addition to the angle, you might also read the tangent of the angle from the quadrant. The tangent scale is useful if the quadrant is to be used for architectural purposes. Columbus also carried an astrolabe on the first voyage, which is somewhat similar to the quadrant. 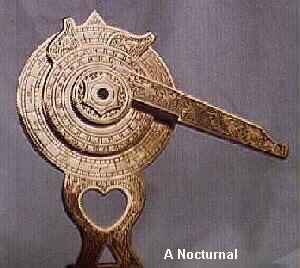 The astrolabe was a complete circle of metal, and had a moving arm (or alidade) that the navigator would sight along to find the star's altitude. Columbus tried to use the astrolabe once, but was stymied by bad weather, and he never used it again. 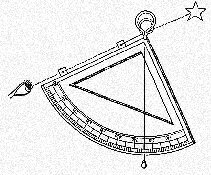 Both the quadrant and astrolabe are dependent upon gravity to work, so they can measure only vertical angles. The quadrant was accurate to about a degree or so, and the astrolabe was a little less accurate. Time aboard ship was measured by a sandglass (or in Spanish, ampoletta). It was the responsibility of the ship's boy to turn the glass every half-hour in order to measure the time until the watch changed. Since the sandglass was always running a little slow or fast, it was checked daily against the times of sunrise, sunset, or midnight. Midnight could be determined by using a nocturnal, a nifty little tool which tells the time of the night by the rotation of stars around the celestial pole. 3. The First Voyage Failures. After navigating successfully across the Atlantic using his familiar dead reckoning methods, Columbus tried to find his latitude using the quadrant on October 30, 1492. At the time, he was at Puerto de Mares, Cuba, probably the modern Nuevitas, at about 21° 30' North latitude. But the result he obtained from the quadrant was 42 degrees. He made another reading from the same place on November 2, and got the same flawed result. Continuing along the coast of Cuba, Columbus again tried a quadrant latitude reading on November 21, and again came up with 42 degrees. Columbus was by now aware that the quadrant reading was incorrect, but he dutifully recorded the reading in his log anyway -- he blamed the quadrant for the bad result, and remarked that he would not take any more readings until the quadrant could be fixed. Columbus made two separate attempts to measure his latitude by two different methods on December 13, while anchored in a harbor in northern Haiti. Columbus had read works by the Greek astronomer Ptolemy, and he knew that Ptolemy often referred to a city's latitude according to the length of daylight at the summer solstice (more northerly places have longer daylight at summer solstice). December 13 was the day after the winter solstice in 1492, which is just as good for latitude measurements (because: the length of daylight at summer solstice is about the same as the length of night at winter solstice). Columbus took the opportunity to measure the length of daylight, finding that the day was 10 hours long. This is also a fairly bad result, but Columbus did not convert the daylight measurement into a latitude, probably because he did not know enough trigonometry to do so. That night, he made his second attempt to determine latitude within 24 hours. Going back to the quadrant, he again tried to determine the altitude of the North Star, and this time got a reading of 34 degrees -- still far from his correct latitude of 19 degrees. Finally, on February 3, 1493, while on the return voyage, Columbus tried to determine the altitude of Polaris using both the quadrant and astrolabe; but the waves were so high he could not get a reading. The quadrant readings Columbus obtained on his first voyage are horrible by any standard. Some have suggested that Columbus mistook another star for Polaris, but that seems ridiculous: Columbus used the stars of Ursa Minor to tell time at night, so he was very familiar with that constellation. In 1983, James E. Kelley, Jr. provided the solution to the mystery: as mentioned above, many quadrants in maritime museums have tangent scales. If Columbus misread the scale, he might have recorded the tangent of his latitude (without the decimal point) instead of his actual latitude. If that were the case, Columbus's measurements would only be wrong by a couple of degrees or so, which is not bad considering the technology. In any case, it is clear that at this point in his career Columbus was not familiar enough with celestial techniques and tools to use them successfully. So it is not surprising that on his second voyage, there is no record that Columbus attempted to use celestial navigation (except for the fraudulent eclipse longitudes). Instead, he stuck to the tried and true dead reckoning practice of "rhumbline sailing", keeping a constant west-by-south course the whole way from Gomera to Dominica in the West Indies. 4. The Third Voyage: Some Improvements? In 1498, Columbus sailed from Spain with six ships of supplies for the settlers on Hispaniola. This is the only voyage on which Columbus made regular and serious attempts at celestial navigation. However, the results he obtained were still quite poor, even by the standards of his day. When he reached the Canary Islands, Columbus split his fleet: three ships would sail west-southwest, direct for Hispaniola, while Columbus himself would take the other three ships southward to the Cape Verde Islands, and then west. The reasons for this maneuver are still debated. "I found that there between these two straits, which, as I have said, face each other in a line from north to south, it is twenty-six leagues from the one to the other, and I cannot be wrong in this because the calculation was made with a quadrant. . . . In that on the south, which I named la boca de la Sierpe, I found that at nightfall I had the pole star at nearly five degrees elevation, and in the other on the north, which I named la Boca del Drago, it was at almost seven." In this case, we know both the dates of the observations (between August 1 and August 12, 1498 -- the period in which he explored the Gulf of Paria) and the time of day (nightfall, according to Columbus's own writings). Therefore we can be fairly sure what the true altitude of the North Star must have been. Giving Columbus every benefit of the doubt, we may assume that he measured the altitude of Polaris on August 1, 1498, at the Boca del Sierpe (10 N, 62 W) at the beginning of nautical twlight -- the time when the Sun reaches 6 degrees below the horizon, and bright stars first become visible. This occurred at 2249 UT for that date and location. At that time, Polaris was already 8° 10' above the horizon, and rising -- compared to Columbus's report of less than 5 degrees. The observation at Boca del Drago could have been made either on August 4 or August 12, but August 4 is the less unfavorable (nautical twilight began at 2248 UT). His anchorage was 10° 43' N, 61° 53' W, so Polaris was already 9° 1' up (and rising), compared to Columbus's report of less than 7 degrees. Columbus then may have created fake observations of Polaris to match his already-known distance, using his adopted size of one degree of latitude, which was 56 2/3 miles (or 14 1/6 leagues). In other words, since Columbus knew that the west coast of Trinidad was 26 leagues long, and he also knew that 28 leagues was about two degrees of latitude, he manufactured "observations" of Polaris that differed by about 2 degrees, to match his dead reckoning. For more examples of Columbus faking celestial observations to match his dead reckoning, see the page on the eclipse longitudes. Not much of Columbus's own writing about the fourth voyage survives today. But we do know that while marooned on the north coast of Jamaica, he found his latitude to be 19°, which is within a degree of the correct number. This high accuracy could only have been achieved if Columbus had been using celestial techniques. It also suggests that even late in his life, Columbus continued to be fascinated with the latest navigational methods, and continued to learn.